UVACollab HelpUVACollab DocumentationGetting Started Course and Collaboration SitesHow do I create a new course or collaboration site? How do I create a new course or collaboration site? You will be taken to the same site creation workflow from all starting points. Choose how to view the steps. Watch a video for creating a Build Your Own Collaboration site. 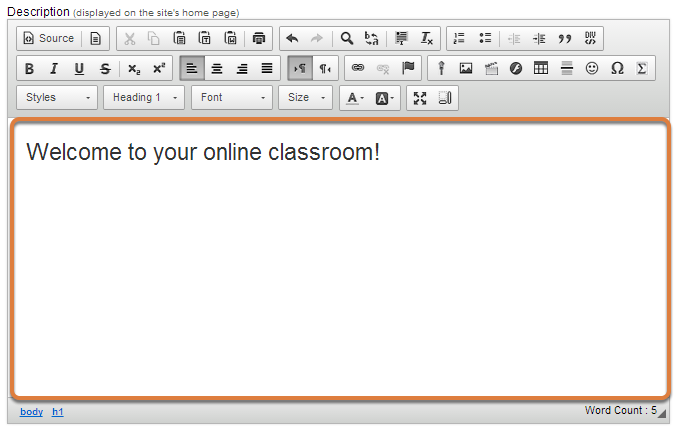 Watch a video for creating a course site using a template. Create a new site from Worksite Setup. Select the Worksite Setup tool in your Home site. Click the New button at the top of the Worksite Setup screen. Or, create a new site starting in My Sites. Click on My Sites in the top banner. Click Create New Site in the My Sites menu. Or, create a new site starting from your Account menu. Click on your Account name in the upper right corner of the banner to open the menu. Click Create New Site to launch the site creation workflow. Select your preferred site creation option. Build your own site: A build-your-own site presents a workflow that lets you choose the tools and features to include in your new site. Create site from template: A template-based site comes with pre-selected tools to streamline the site creation workflow. Certain site templates come with pre-configured tools designed to facilitate development of a course portal, e.g., the Activities Grid and Activities Menu site templates. Note: You may add or remove tools from sites created by either method once created. See How do I add a tool to my site? and How do I remove a tool from my site? 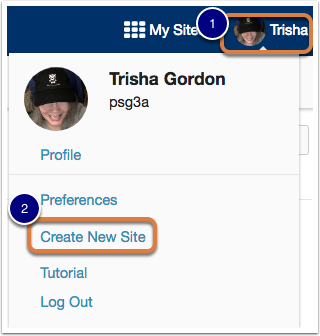 If using the Build your own site option, choose either collaboration site or course site, depending in which type of site you want to create. Click the Collaboration or Course menu to expand and select from the list of available site templates. Select one or more rosters to add to your site. Select one or more course rosters in the list. Click Continue or Continue with no roster. Enter the site title (required). If a roster was selected, the Site Title will be pre-populated with the name of the roster. In this case, you may edit the Site Title or keep the pre-populated default title. 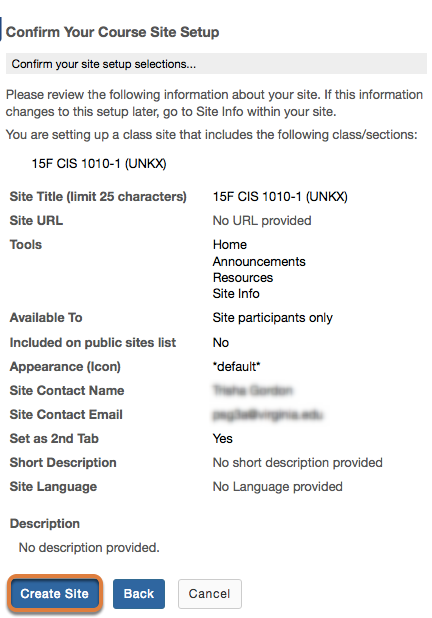 If no roster was selected for a course site, or if you are creating a collaboration site, enter a Site Title up to 25 characters long. Click on the desired language to select it or leave as-is to accept the default language (English - American). Enter a site description (optional). The information entered into the description area will appear on the site's home page. You may use the Rich-Text Editor here to enter your description. Enter a short description (optional). Accept or change the site contact information. Select site tools (for build-your-own site option only). Note: The tool selection screen is not presented for sites being created from a site template. Place a check mark next to any tools that you would like to add to the site. 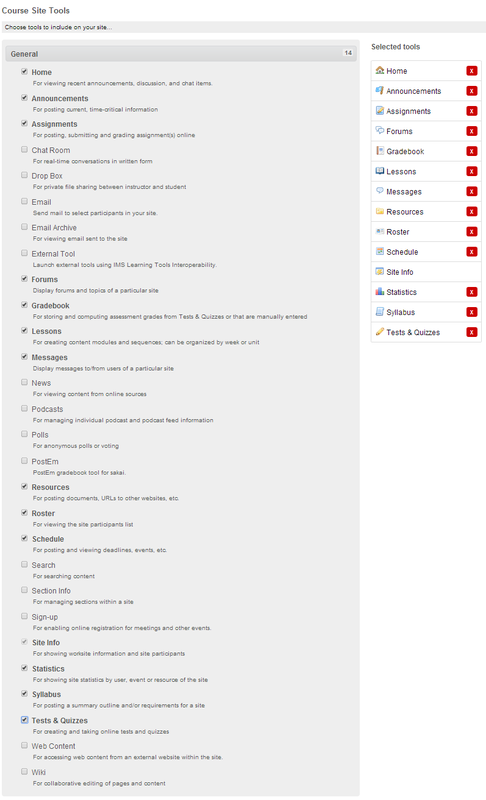 Remove check marks next to any pre-selected tools that are not needed in the site. 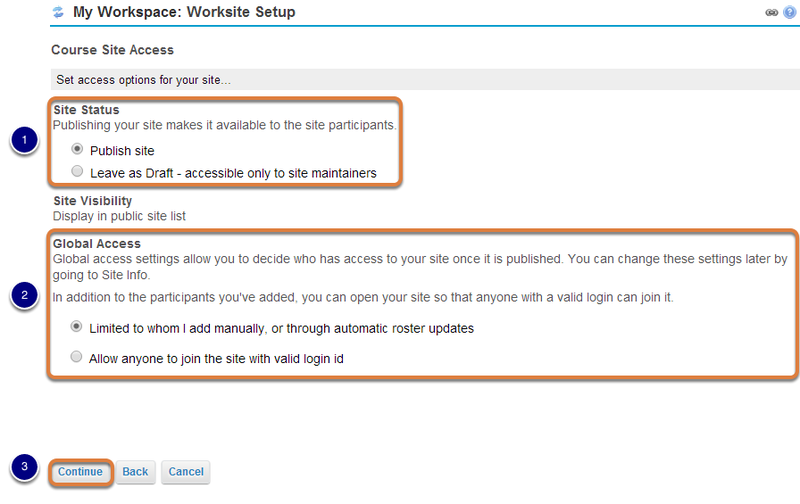 Select to Publish the site, or Leave as Draft (i.e. unpublished). Unpublished sites are only visible to site owners, not other participants such as students. Choose to make site access Limited to whom I add manually, or through automatic roster updates or Allow anyone to join the site with valid login id. Prev: Where is my site? Next: How do I navigate in a site? What are the important policies and rules for UVACollab? How do I delete a site I created? How do I restore a site I deleted? How do I re-use content from one site to another site? How do I unpublish multiple sites simultaneously? What are Basic site templates? What are Activities site templates? How do I add a tool to my site? How do I manually add people to my site? How do I remove people from my course or collaboration site? How do I remove a class roster? How do I resize or maximize the Rich-Text Editor window? How do I enable and use LaTeX in my site? How do I set up my profile photo? How do I add or edit my profile photo from the header bar? How does an instructor view a course site as a student? How do I check what students or members can see and do in my site? What is the Waitlisted Student role? What can waitlisted students do in my course site? 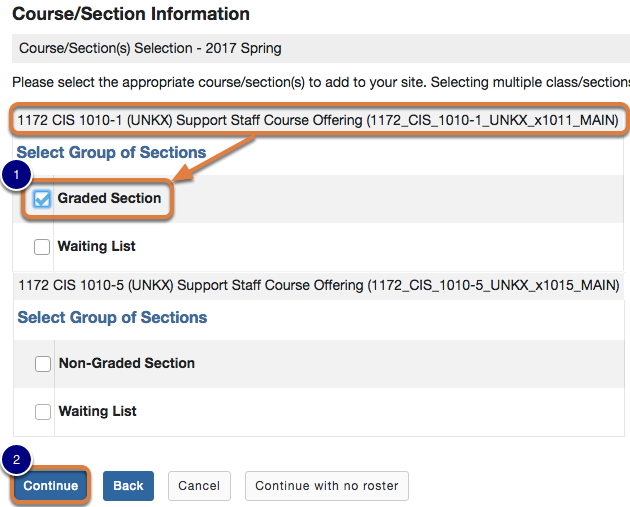 How do I add all of my waitlisted students to my course site? How do I remove all of my waitlisted students from my course site? 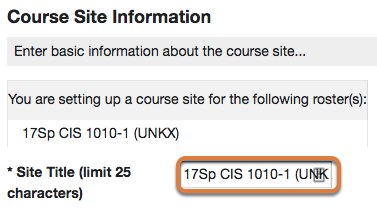 How do I add or remove individual waitlisted students from my course site? At the end of the add/drop period, what happens to content created by waitlisted students?